Hi everyone, I got a fiddle for my birthday, but I haven't played any music in the past ten years or so, and that was bass clarinet in my school band. So I've got the fiddle tuned so it sounds like the instructional video, but I don't understand something. Why is the open E string written on sheet music as an F? Did I tune it wrong? I'm pretty confused and I can't seem to find the answer with a google search. 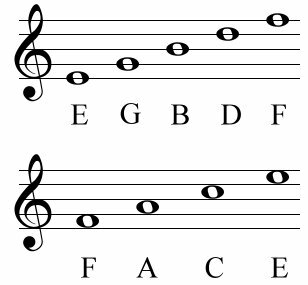 Maybe I am misunderstanding you, but as far as I am aware the open E is not written as an F. The open stings are E,A,D,G, and the open E corresponds to the upper most space just below the top line on Treble clef sheet music. The others are on the right under "Beginners tutorials." I highly recommend watching them. I won't post any more links, because this site is too jam-packed with helpful stuff. Just scroll down to the bottom of the right-hand side and look for the section called "Learning Tools"
Just remember - smile and have fun! and it looks like where it says "E=I First highest string" The note written above it is an "F", or am I mistaken about how to read music? Maybe that clarifies my question a little bit. On the page you linked to, the note indicated by the circle in the space above "E= I First highest string" is in fact an E and not an F. It would be an F if the music was in Alto clef. So, I think you are reading it right, just in the wrong clef. Violin is Treble. Note the attached images and the differences. Alto is on top and treble is below.